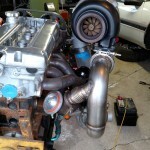 A friend of mine is building a fresh compound turbo setup for his race car. As you can see, it’s looking pretty serious. His previous experiments have attained him 7 second quarter mile passes at 180+ miles per hour. 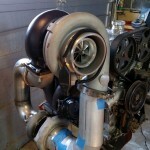 All of this from a factory-built 4 cylinder 4G63 turbo engine block, and a whole lot of boost. Kevin Jewer is his name and he is well known in the DSM community for piloting his rear wheel drive Talon faster than nearly all DSM’ers have before him. I have no doubt that he has an excel spreadsheet that has already proven this turbo combination with hundreds of quarter mile passes. That is what makes Kevin so damn consistently fast. He understands what the engine is really doing, and why. He measures pressure, temperature, and timing of every moving part during every 1320 pass. That data is then added to a spreadsheet and locked away, probably in a safe with chains around it, and an ill-tempered honey badger guarding it. With thousands of passes and endless amounts of data stored away, Kevin can accurately predict what future engine combinations will produce for airflow, temperatures, and of course horsepower. 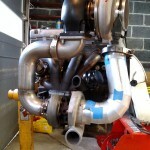 This compound turbo 4G63 combination looks like it belongs on an engine with three times the displacement, and it is leaving many people, including myself, on the edge of our seats for the 2015 racing season. ← Amherst New Hampshire Car Show Swap Meet (Cruising to Amherst) Closed in 2015!